← Operación Voyager y la maniobra propagandística de sus imputados. 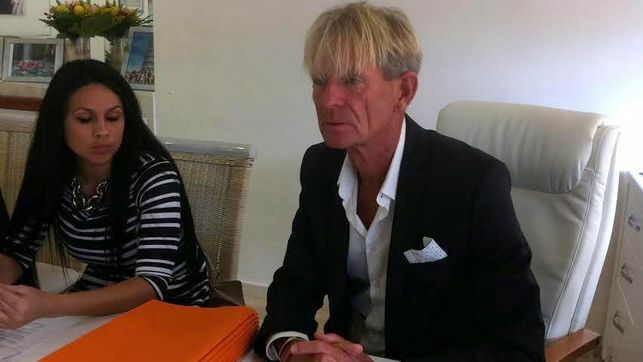 The main accused in the alleged macro fraud which happened in the South of Gran Canaria; Eugen Friedrich Kaiser, together with his two lawyers, held a press conference yesterday. This conference was actually held from the same place where the alleged frauds took place, the Club Puerto Atlántico. We understand that an alleged criminal, who is accused of various crimes, not only can but even has the obligation to defend himself with all resources he has. But we also believe that the efforts to defend himself should be centred in the court house, where these alleged crimes are investigated. The press conference from yesterday, and which have been echoed by various local media, is an attempt to influence the public opinion through the use of propaganda. Mr Kaiser already used the same tactics in 2006, days after his second detention by the police, appearing in the media to denounce the police action, illegal detention and other abuse. 2. The police have acted illegally. “this is a copy and paste job of previous police actions which were archived and which has paralyzed the activity of a company and finished with dozens of jobs”. 3. Just one mention about the alleged fraud. Of course, they did not refer to the reasons for which they were arrested and charged. Neither did they mention the hundreds of tourists who feel cheated and defrauded after buying into the Holiday Product. The press conference yesterday is nothing more than a propaganda campaign with the only intention to artificially attract the support for their court case and generate an attitude change in the public opinion. They try to convince, through lies, that this is an unjustified attack against his company and employees. What they intend to say is that the business was legitimate, selling a legal product, and they are being attacked by a competitor in collusion with the police. Their propaganda campaign focuses on creating external enemies (timeshare companies who want to get rid of a competitor; Mindtimeshare, the Spanish Police), in short, a victimization boast. We believe that yesterday’s event was an attempt by Mr Kaiser to manipulate the situation and whose ultimate goal is to persuade governmental institutions who have to make final decisions about its current judicial complaint. They try to create an image which has nothing to do with the reality. So this is why we wanted to isolate all elements of this propaganda campaign, in order for all citizens to have access to different information then the one given in the commercial media. In this way they can question the veracity of the messages they receive. The reality is that this alleged organized gang of criminals has allegedly defrauded hundreds of tourists visiting the island of Gran Canaria during the past eight years, by marketing a long-term holiday product, which according to the victims, proved a total deception. About this accusation, the most essential one, not one word was spoken yesterday in the press conference. This entry was posted in Bogus Holiday Clubs, Canary Islands, Warnings and tagged Alleged fraud, Eugen Friedrich Kaiser, Eugen Kaiser, Gran Canaria, Holiday Club, Hotel Club Puerto Atlantico, Lifestyle Holidays, Operation Voyager, press conference, propaganda campaign, Voyager Travel. Bookmark the permalink. Of course it was fr*****ent, we paid for a 3 week block of 1 week holidays were told they were not timeshare which was not true. Also every time we looked at booking a holiday we were told we could not go to that particular place but offered Gran Canaria or Tenerife. Both situation were hilly and as I have very bad arthritis in my hips I sad we could not go to these locations. Their brochure had many locations in it but try and book one and it was a big fat NO. We asked for Lanzarote but at every turn we were blocked from taking a holiday of our choice. To this day we still have NOT had a holiday with GC Resorts which was one of Mr Keisers operations. We paid our money in January of 2012 and here we are 2 years later out of pocket and no holiday. This man should be strung up, we are OAP’s who cannot afford to throw our money away on devious cr**** like this, shame on him !!!!!!! I agree with both the above. We were co**** out of a lot of money. Even if there was only one complaint he would still be guilty of fraud. I wrote to Day International requesting a full refund and stating my reasons. I did not receive a reply. Any reputable company has a complaints procedure. I sincerely hope that a prison sentence is a big part of his future! He’s that full of ****, it’s difficult to work out which end it’s coming from. I hope he rots in a Spanish cell for a very long time.